Came here Friday for lunch and I am really glad I came. This was one of the first restaurants I wanted to try because the menu looked really good and it is one of Wolfgang Puck's restaurants. The decor is very simple and modern. If you have never been here before, it might be a little hard to find the restaurant but just keep your eyes out for signs. For the first course we both ordered the Seared Hamachi Salad with Jalapeño Ponzu Vinaigrette. The hamachi was very tasty and the accompanying salad was delicious. 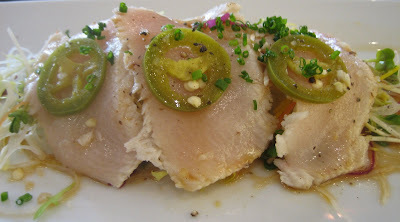 Just beware of the jalapeño because they can be very spicy, but they are wonderful with hamachi. In order to try more entrees, we decided to split the Miso Broiled Butterfish with Chili Orange Noodles and the Kobe Burger with Wasabi Aioli, Teriyaki Onions, Jalapeño Jack Cheese, & Sesame Bun. Fair warning, the butterfish dish was extremely tiny but delicious. 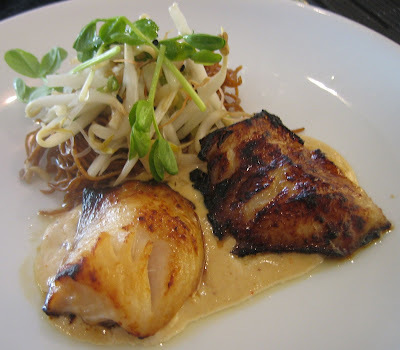 Even though I had eaten butterfish the day before, the fish here was very tender and full of flavor. The noodles were done nicely and complimented the fish. What I really enjoyed was the Kobe burger. It was spectacular! First of all, it was 10x heavier than the butterfish. I normally hate hamburgers but I thought this was a perfect blend of favors. 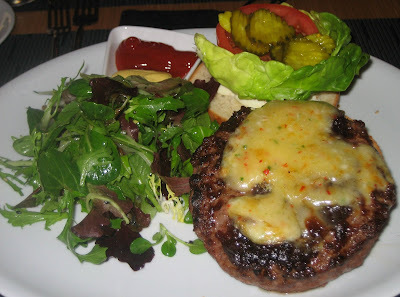 I recently went to Daniel Baloud's Brasserie and had their famous truffle burger, if I had to choose I'd rather eat this yummy Kobe burger. The onions really gave the burger a sweet taste and really brought out the flavor of the meat. I'd definitely come back for lunch because of this burger. We also ordered different desserts so we can taste more of the menu. 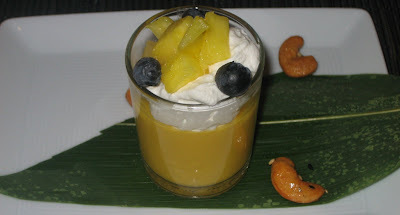 The Iced Mango Pudding served with Candied Cashews & Fresh Fruit was superb! They must have used ripe fresh mangoes for the pudding. 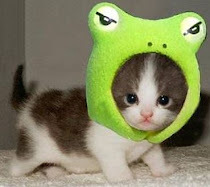 I would recommend you to order this dessert. Don't order the other one we tried, Almond Roca Samosa with Caramel Banana Chocolate Dipping Sauce. At first I thought it sounded so interesting and delicious, but the dish fell short. It was only a big fried dough with barely any melted chocolate inside. You couldn't really taste the Almond Roca. I ate the pudding first, so I was extremely disappointed about the samosas. All in all, I will definitely be back again and this experience has increased my opinion of Wolfgang Puck.